Having a hysterectomy (an operation where a woman's uterus/womb is surgically removed) is such a hard decision to take for any woman. Because this procedure spells the end of a woman's ability to get pregnant / becoming a mother. Normally, most doctors will persuade you into trying other non-surgical options first (hormonal treatment etc) unless the patient already had children. But the fact that any other treatment to cure my adeno aren't helping --and the pain has begun to consume my daily activity--a hyst is definitely the best way to go. My sisters (I have four sisters) weren't happy with my decision but they honored it anyway. Here in Indonesia (maybe in other part of the world too), having children will be on the minds of most women. I would say there is a cultural expectation from families, society, colleagues, etc...that women have to marry and have children. "How many kids do you have?" or "When are you going to have kids?" questions is just so much part of every day conversation that it gets asked all the time when you meet your relatives, friends, etc. My eldest sister was devastated when she miscarried and had to wait for six years before having my niece, V.
If you’re married and choosing not to have kids, you won't get congratulations but questions. "Why? Are you sure about that? You’ll regret it later when you’re older, Oh you'll change your mind! ", etc ... People are so interested in making you conform to the same standards they have. I love kids - and considered myself lucky since I have two nieces and one nephew. I find that renting my siblings little critters is much more effective for me than owning. The kids love their auntie and I find an equal joy in pampering them. I am not worry with "who's gonna take care of me when I get older" either. Because there's no guarantees--even if I had kids--that they will care for me when the time comes. Life isn't about what happens to you but how you react to it - you have a choice!. That said, I admire people who want to be / already be parents. Do you ever feel under pressure to have kids? I am up late last night. I can't sleep so I end up flipping channels on the TV. I rarely watch TV anyway. I have my favorite shows (football, cooking show) but I don't watch anything on a regular basis. I checked what was on the various channels. Some showing films I had either seen before or didn’t want to see. There is, to be sure, a lot of crap on TV, but funnily enough our brain likes being entertained with lots of bright, moving colors...just because it requires no real thought at all. When I was a kid, every Sunday I would watch Little House on the Prairie episode with my younger sisters. I loved that show. It feels like forever to watch the next episode as they only aired it once a week. Mind you there was only TVRI then, yes - the one and only channel!!!! but the good thing is there's no commercial break! Right now every show that runs has ten minutes or less of programming, then three minutes of commercials and so on. We are bombarded with ads from companies that want you to buy their products. Television is, after all, an engine for advertising and selling, it does not exist to entertain us; it exists to sell to us. Those who program the shows are aware they have to capture the public’s attention and to hold it long enough to advertise a product. Like computer, TV has become a big part of our lives. Almost all families own a TV, a lot of families have their TV on most of the time (even when no one is watching). It is a way to spend their free time, relax, stay informed, get touched by a story whether it's a news or movie or a series. I don't have anything against TV, but I think TV make people lazy. No interaction, no imagination, nothing. The only thing you have to move is your thumb on the remote control. I have a friend who has been without a Television since her kids were small. She catches up on the news from the newspaper, radio and (now) the internet. She spends time reading, going out for a walk or a drive, gardening, listening to music on the radio, playing with her grandkids or just talk. She said it's fun actually because she has so much more to do rather than watch television. Although her kids do get tempted at times to buy one for her (so she can catch up with her friends about the shows and stuff) she doesn't think it's worth it. So, how much time do you spend watching television? An hour per day? two hours? more? Do you believe you could live without TV let's say for a month? First, I'd like to thank you all for the lovely messages that you've sent. It makes me happy to know that you all care and are thinking of me, and I have been enjoying reading them. Special thanks to Eka from Pernik Unik for sending me the lovely Bali sundresses for my recovery. It will be a few weeks from now before I can wear my jeans again. Thank you, thank you! Today marks 1 week and 2 days since my surgery, and I am back to a full normal life again. The surgery (I have had a partial/subtotal hysterectomy keeping my ovaries and cervix intact) went well. My uterus turns out was much bigger than the ultrasound indicated. It measured about one large adult fist size with leiomyoma and adenomyosis which have been the sources of my pain all this while. Because of that, my gyno doctor put me on 3 months of treatment with Danazol so any remaining endo that is probably still left behind can be eliminated. The downside of hormones pill is weight gain as my hormones will be all out of whack. Well, I don't really think it matters too much, I can increase my exercise and continuing my healthy diet. Recovery has been a smooth process for me. My abdomen bulges around incision is diminishing everyday. I had my op on a Saturday morning (May 17), by 9pm or so I was out of bed and walking up and down the hospital hall ways, and home on Tuesday morning (May 20). I've been up for a walk each day since then. In fact I have been going to the mall, went to the bank, went to see the gyno doctor to collect my Pathology report on Saturday (May 24), visiting my sister in Bogor yesterday. All in all I am feeling great, much better than I would have expected. I still get those twinges every now and then on my belly but not so bad, my incision is healing well, my energy level is good, I look forward to doing more, but I know I shouldn't push it too much. I’m glad that one month prior to surgery I devoted myself in getting to the morning walk as much as I did, had a strict veggies and fruits diet plan ... it was a huge benefit in getting myself up and in and out of bed as my physical condition is on top form. Pain is nonexistent except I notice that I have been resting and sleeping a lot and retire to bed earlier lately...LOL! I forgot to mention — I feel really good. I think it was a good decision to have this surgery. I am waiting for the day when I would be pain free and am hoping for everyday to feel better. Most of us do not like to think about a disaster in our community, but the deadly Cyclone Nargis in Myanmar and the powerful earthquake in China recently got me thinking that disaster can strike anywhere at any time, often with little warning. When mother nature is angry, it could be beyond belief. Located in the so call ring of fire, Indonesia is prone to natural disaster. It feels like not so long ago there was a tsunami in Aceh, earthquake in Yogya, mudflow in Sidoarjo, flood in Jakarta and landslides in other places of Indonesia. These events really showed us how vulnerable we are and that you just never know when a disaster could strike your family. The major flood in Jakarta last year taught me that our government never learned and prepared in the event of major disaster, let alone taking quick action. All they could do is blaming the nature and the poor urban planning, but nothing was done until the next one strike again. I remember there's no electricity, no clean water, and no telephone service for several days when my area was swamped by a hip to waist high water. It was an unforgettable memory that deeply etched in my mind because I could not save my dog out of the place earlier. Now, when disaster strikes...are you prepared? Nobody likes to wait. Waiting in line at the bank or grocery store, waiting for a flight that has been delayed, waiting in line to get through the immigration, waiting at the doctor's office for two hours while the doctor saw you only like ten minutes, waiting for the traffic light to change (waiting in Jakarta heavy traffic surely doesn't qualify as good times...LOL!) , waiting for the electricity to come back on when PLN suddenly shut the power, waiting when is that darn potholes all over Jakarta streets going to be repaired!?! But I think the most discomfort thing of all is waiting in line to get into the public restroom with your bladder about to explode, wishing the person inside the cubicle to pee faster. I am not an impatient person but waiting can be excruciatingly frustrating, esp. the waiting in a bathroom line. So, are you good at waiting or are you impatient? What's the longest you waited in line for something? 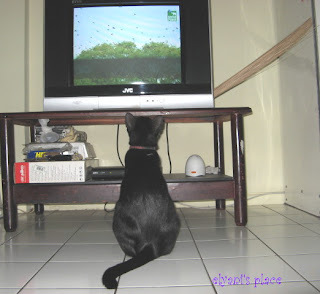 My cat, Suneo, likes to watch Discovery Channel. He will sit right up close of the TV every time he sees something he is familiar with like the birds or cats ... LOL! Does your cat or dog watch TV too? I have been on the semi raw food diet for two weeks now. I am not looking to lose weight but am trying to ease the persistent painful period that I have been suffering for many years. The basic principle of the diet is to eat a high proportion of raw vegetables, fruits, nuts, grains and seeds. Food that contain starch such as bread, rice, wheat, pasta and potatoes - should be avoided, as should meat and most dairy products. Well, I haven't gone "totally raw" yet but am transitioning into it rather slightly. So far, I have been successful to just eat veggies (Indonesian cooked veggies, not salads) without rice. My side dish would consist of either tofu, tempeh or white fish. I'm also still having 2 or 3 slice of wholemeal bread for breakfast in the morning with jam or peanut butter. My lunch is still cooked but I hope to change that slowly. On the weight loss front, I haven't lost much weight. My weight now is around 49-50 kg (I am 5' 2"). Well, I'm not worried, at least I haven't gained any weight. Of course, when I walked past the food court or cake shops, I wish I could have some but I reminded myself that I must have my appetite under control. Whenever I’d have a “weak” moment, I would eat a few slice of tomatoes and cucumbers. Aside from eating raw I too get these kind of 'cravings' to get up early and go outside for a morning walk which has become my daily routine now. When you look at students in the US or Europe, there seems to be little idea of what is appropriate and inappropriate dress for the classroom. You can wear whatever you want and from what I see on the movies, there are plenty of girls who wear skirts where if they just bend a little bit you can see everything. Here in Indonesia almost all schools from preschool to the last year of high school, private or state-run have to wear uniforms. Then there's also a sport uniform and one more, scout uniform! I have to say I liked having uniforms because you don't have to worry about what to wear everyday. It gives a sense of identity, it helps maintain a neat and tidy appearance, it is also less expensive for parents in the long run. 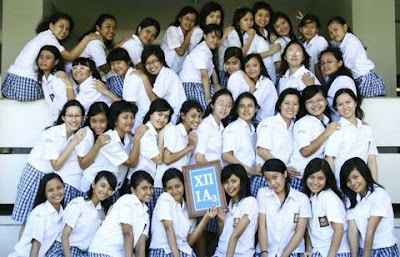 I wore uniforms all my school going days and my favorite was the school uniform in my high school time in Yogyakarta back in the eighties: a short-sleeved white shirt with a checkered dark blue and white pleated skirt underneath. The skirt length is regulated, no noticeable jewelry or make up allowed except for a single watch, a one piercing per ear, or a simple chain necklace. We would practically get warned if we customized our uniform, because the school is not about individualism. Regardless of my former high school strict dress code, I am all for it. How do you feel about school uniforms? are they good or bad in your opinion? Have you ever been lost when you were in an unfamiliar place? I can honestly say, I have gotten lost more times than I would care to admit. There's been a couple of times I've thought I was in one place I knew until the evidence mounted that I was in another. Needless to say, I get lost easily. I eventually find my way, but I ended up walking pretty much all over the place before realizing I'm heading the wrong way and then I turn around. I'm not dumb, but I think I am lacking the portion of the brain that holds a sense of direction. I do not understand the concept of north, south, east or west. I was more comfortable with words like 'left' and 'right' or looking for certain landmarks. I'd never remembered my sister's place each time I visited her in Singapore. I needed a few days to get used to the route before I get lost again...LOL! My youngest sister - on the other hand, she has a good spatial abilities and excellent sense of direction. She will always know where the starting point is. I envied her skill, and a little mad that she inherits that gene from my late dad. In my case, it came from my late mom. So, are you good / bad with directions? do you think people have a natural ability rather than a practical skill when it comes to navigating? Are there ways a person could improve their sense of direction?